The interest parity can be represented as a curve, called the expected real returns curve or the parity curve. This is one of the curves that can be used to describe the foreign exchange market. The foreign exchange market has the dollar–euro exchange rate on the y-axis and the real returns in dollars on the x-axis. The figure illustrates the downward-sloping parity curve, which implies the expected real return on the euro-denominated security. In all economic models, it’s important to be mindful of which market is considered. This consideration is also important in the MBOP. Additionally, because this model deals with an exchange rate and two countries’ real interest rates, you need to use the exchange rate and the real interest rates in a consistent manner. For example, the foreign exchange market is in dollars in the figure. How do you know? Because the exchange rate on the y-axis implies the amount of dollars per euro, which is clearly in dollars. Note that there is now an expectation superscript associated with the real returns on the euro-denominated security in dollars to emphasize the following idea. If you, an American investor, invest in dollar-denominated securities, you don’t need to deal with the expected exchange rate. However, if you want to consider a euro-denominated security, its return has to be comparable to that of the dollar-denominated security. In this case, you need to consider the expected exchange rate, because the current exchange rate is likely to change while you are holding the euro-denominated security. This is why it is appropriate to explain this parity curve as the expected real returns on euro-denominated security in dollars. Based on the parity equation, the expected real return on the euro-denominated security in dollars is equal to the addition of the real return on the euro-denominated security and the expected change in the exchange rate. At this point, it’s important to recognize that the real return on the euro-denominated security is determined in the Euro-zone’s money market, based on the discussion about the money market in the previous section. And the term in the bracket implies the expected change in the exchange rate, as you perceive it. It seems that a higher expected real return on the euro-denominated security in dollars is associated with a lower dollar–euro exchange rate. Similarly, a lower expected real return on the euro-denominated security in dollars is associated with a higher dollar–euro exchange rate. This means that the dollar appreciates from Point 1 to Point 2. 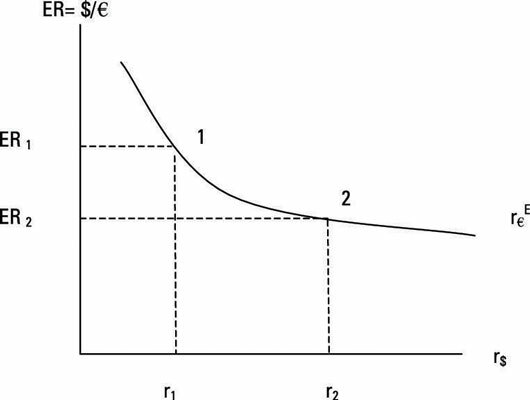 Why is the parity curve downward-sloping in the exchange rate-real return space? The answer lies in the parity condition. Continue assuming real returns on the dollar- and euro-denominated security; also assume that the expected exchange rate does not change. Note that the current exchange rate [($ / €)t] is on the y-axis of the foreign exchange market. If the expected exchange rate is assumed to be fixed and the current exchange rate can change, you can show that depreciation of a country’s currency today lowers the expected real returns on the foreign security in domestic currency. Similarly, appreciation of the domestic currency today raises the returns on foreign currency deposits in domestic currency. Following are some numerical examples. Suppose that the current dollar–euro exchange rate is $1.00 per euro, and the expected exchange rate next year is $1.05 per euro. Then the expected rate of depreciation in dollars is 5 percent ([1.05 – 1.00]/1.00 = 0.05, or 5 percent). This means that when you invest in a euro-denominated security, in addition to earning a return on this security, you receive an additional 5 percent return when you convert your euro earnings into dollars in the future. Now suppose that current exchange rate suddenly depreciates to $1.03 per euro, but the expected exchange rate is still $1.05 per euro. You earn the same real return on the euro-denominated security. But what happens to your extra income that comes from the depreciation of the dollar? It’s smaller now because the expected depreciation of the dollar declines from 5 percent to 1.9 percent ([1.05 – 1.03]/1.03 = 0.019, or 1.9 percent). Because the real return on the euro-denominated security, or r€, has not changed, the expected real return on the euro-denominated security in dollars declines as the current dollar–euro exchange rate increases or the dollar depreciates (which is a movement from Point 2 to Point 1 in the previous figure). Therefore, when holding the expected exchange rate constant, a negative relationship exists between the current dollar–euro exchange rate and the real returns on the euro-denominated security in dollars.